The U.S. Commerce Department's National Institute of Standards and Technology (NIST) announced today that it is awarding grants totaling more than $55.5 million to four universities to provide cost-shared support for the construction of new scientific research facilities. "These awards mean four major construction projects in these local areas, with the jobs and economic benefits they bring," U.S. Commerce Secretary Gary Locke said, "but even more important, these four projects provide a major boost to scientific research at four respected universities, enhancing innovation, public safety and environmental protection for many, many years to come." $15 million to the University of North Carolina Wilmington (Wilmington, N.C.) for a new facility for the Marine Biotechnology in North Carolina (MARBIONC) program, matched by an equal amount. The new research buildings will provide state-of-the-art laboratory facilities supporting academic research across a broad range of topics affecting the Commerce Department's mission, including fundamental physics research, nanotechnology, aquaculture and marine ecology. That competition provided cost-shared funding for the construction of new buildings or the expansion of existing science buildings as they related to the mission of the Department of Commerce and its agencies, including NIST, the National Oceanic and Atmospheric Administration (NOAA) and the National Telecommunications and Information Administration (NTIA). The competition was open to institutions of higher education and nonprofit organizations. Proposals were evaluated on the scientific and technical merits of the proposal, the quality of the design of the proposed facility and the adequacy of a project execution plan. NIST expects to award approximately $120 million in additional research construction grants under a new competition announced in May. (See "NIST Announces Competition for Research Construction Grants," May 27, 2009.) Those awards will be announced by March 2010. The new SUSTAIN facility to study the physics and dynamics of hurricanes and their impact on coastal structures will be part of this planned Marine Technology and Life Sciences Seawater Research Building at the University of Miami's Rosenstiel School of Marine and Atmospheric Science, Miami, Florida. 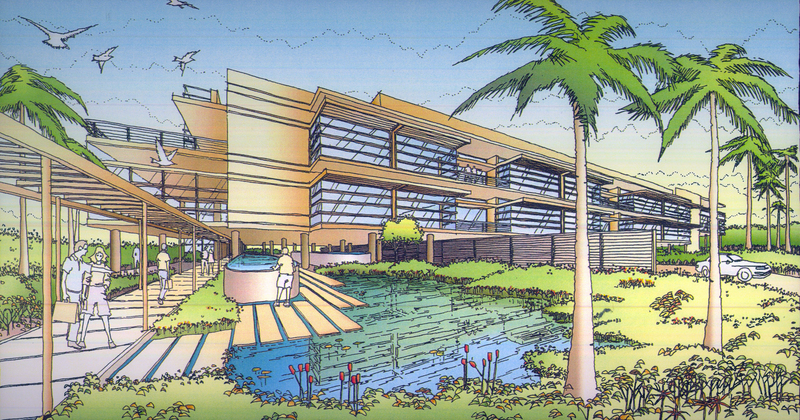 The planned Marine Technology and Life Sciences Seawater (MTLSS) Research Building to be built at the University of Miami's Rosenstiel School of Marine and Atmospheric Science will house state-of-the-art seawater laboratories and multidisciplinary research facilities dedicated to two major areas of coastal studies—the destructive power of hurricanes and the biology of coastal waters. Hurricanes are the costliest natural disasters that strike the United States. A better understanding of how structures withstand—or fail to withstand—wind, wave and surge forces during a hurricane could lead to improved construction standards and practices to enhance resiliency and to protect human lives. The building will include an 8,520 square-foot (792 square-meter) Surge-Structure-Atmosphere Interaction (SUSTAIN) research facility to study the physics and dynamics of hurricanes and the associated impact of severe wind-driven and wave-induced storm surges on coastal structures. When complete, SUSTAIN will be the only facility in the world capable of generating hurricane force winds in a three-dimensional test environment allowing studies of the interaction of wind and water during coastal storms. The MTLSS also will include the 47,942 square-foot (4,454 square-meter) Marine Life Science Center (MLSC), a separately funded facility to support fundamental coastal biology research in areas such as coral reef biology, aquaculture, fisheries, biological oceanography and marine biomedical science. The MLSC will provide modern, technologically advanced facilities at the university. Both SUSTAIN and the MLSC will benefit from the building's ready access to fresh seawater. This integrated facility will provide significant new opportunities for interdisciplinary bio-physical research. Research at the new MTLSS will support the mission interests of NIST: to improve the understanding of the design of disaster-resistant structures. The new facility also will advance the interests of the National Oceanic and Atmospheric Administration and the research goals of the University of Miami by providing a cutting-edge building that will provide an enhanced understanding of coral reefs, aquaculture, fisheries and marine ecosystems. The facility is expected to be completed by fall 2012. See also the University of Miami/RSMAS release, "NIST Awards University of Miami Economic Stimulus Funds to Study the Impact of Hurricanes on Coastal Structures & Ecosystems." The planned Center for Advanced Science, Innovation and Commerce at Auburn University is designed to provide facilities for five major multidisciplinary research groups working on standards, measurement and forecasting related to the environment, biofuels and water and food quality and safety. Detection and Food Quality and Safety Research Cluster—to develop advanced sensors and measurement technologies to improve food quality and safety, including innovative in vivo sensors to monitor and accurately forecast the health of plants and animals. The 21 research laboratories in the new facility will include two simulation labs, three genomics labs, three labs for predictive biology and informatic forecasting, four labs for ecosystem health forecasting and marine aquaculture, two labs for water quality standards and detection, two labs for biofuels and quality standards, two labs for bioproducts, two labs for detection and food quality and safety, and one lab for economic impact and forecasting. The center's research on improved measurement technologies and standards in areas such as water, environmental quality and biofuels relates directly to the NIST mission, while its work in the areas of marine ecosystems and aquaculture will directly impact key mission areas of the National Oceanic and Atmospheric Administration. The facility is expected to be completed by spring 2012. See also the Auburn University release, "Auburn awarded $14.4 million federal grant for science and commerce center." 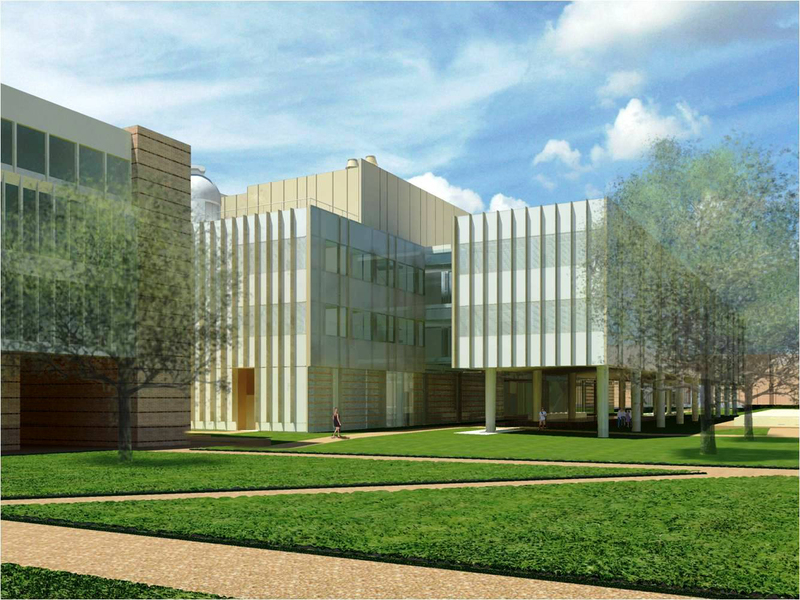 Artist rendering of the planned new Brockman Hall for Physics at William Marsh Rice University, Houston, Texas. The planned Rice University Brockman Hall for Physics will allow the university to create a state-of-the-art facility that meets the exacting requirements of modern physics. This building will consolidate activities research in fundamental and applied physics—which now are conducted in six different buildings across the campus—and promote collaborative interactions. The 110,000 square-foot (10,219 square-meter) facility will include vibration- and noise-controlled laboratories located underground to support work in atomic, molecular and optical physics; biophysics; condensed matter physics; nanoengineering and photonics. In addition to vibration control, laboratories in the new building will have substantially better temperature, humidity and air-flow control than Rice's existing research facilities. The university has set a sustainable design goal for the building of a silver rating from the U.S. Green Building Council's LEED (Leadership in Energy and Environmental Design) rating system. The Brockman Hall will include 16 physics labs, six engineering physics labs, faculty and graduate offices, conference rooms and a lecture hall. The building will house a significant portion of the Rice Department of Physics and Astronomy as well as faculty from the Department of Electrical and Computer Engineering who are pursuing research in applied physics. Rice has long-standing research ties with NIST, and the new facility will support research in a variety of areas with direct relevance to NIST's mission, including nanoscale science and technology, atomic physics, quantum physics, optical technology, electron and optical physics, microelectronics, semiconductor electronics and biophysics. Facility completion and occupant move-in are expected by spring 2011. The planned new Marine Biotechnology in North Carolina (MARBIONC) facility at the University of North Carolina Wilmington's Center for Marine Sciences will be a state-of-the-art, research-to-product building for MARBIONC, a marine biotechnology research program in support of economic development for North Carolina. The MARBIONC program focuses on the application of marine biotechnology to food, health and energy. Research areas include drug discovery based on compounds from marine organisms, detection technologies for both human-origin marine pollutants and biotoxins from microorganisms, algae farming for biofuels and mariculture (marine aquaculture). The program's economic development mission includes workforce development, and it offers a unique "business of marine biotechnology" postdoctoral training program to allow marine scientists to combine laboratory training with study toward a masters degree in business administration. The 69,000 square-foot (6,410 square-meter) MARBIONC facility will include 12 laboratories and three large incubator laboratories for cultured research materials, as well as offices and meeting spaces. Research at the new MARBIONC facility will support the mission interests of the National Oceanic and Atmospheric Administration in oceans and human health, marine ecosystems and aquaculture as well as NIST mission interests in new detection and measurement technologies. The facility is expected to be completed by summer 2011. See also the UNC Wilmington release "UNC Wilmington Receives $15 Million Grant for MARBIONC Facility."